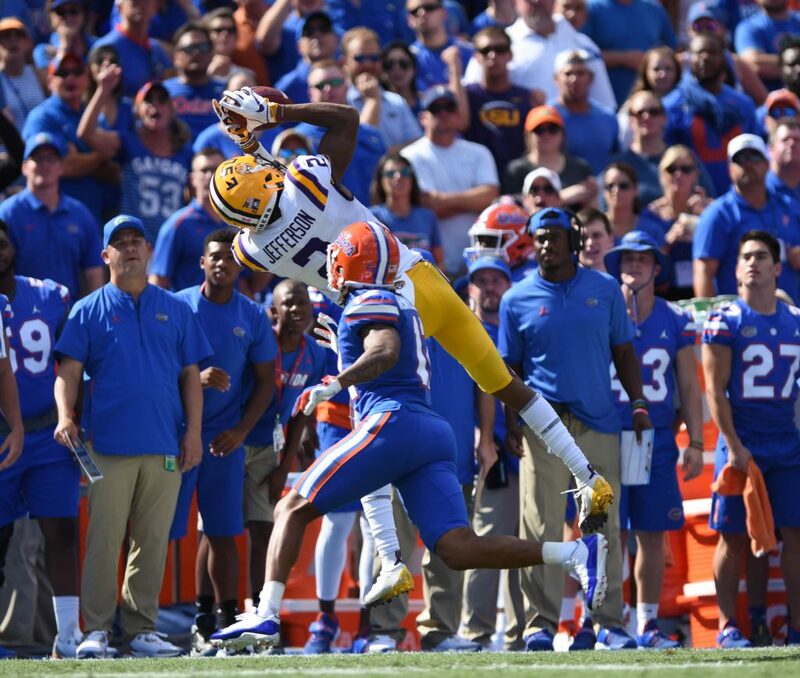 Florida defensive back Brad Stewart Jr. (2) makes the game-clinching play, intercepting an LSU pass late in the fourth quarter for 25-yard touchdown. 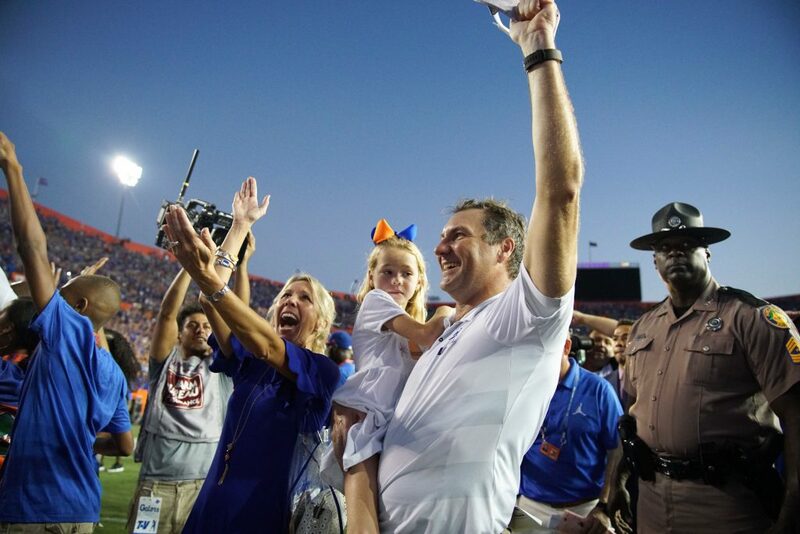 Florida head coach Dan Mullen celebrates the upset with his wife and daughter after the game. 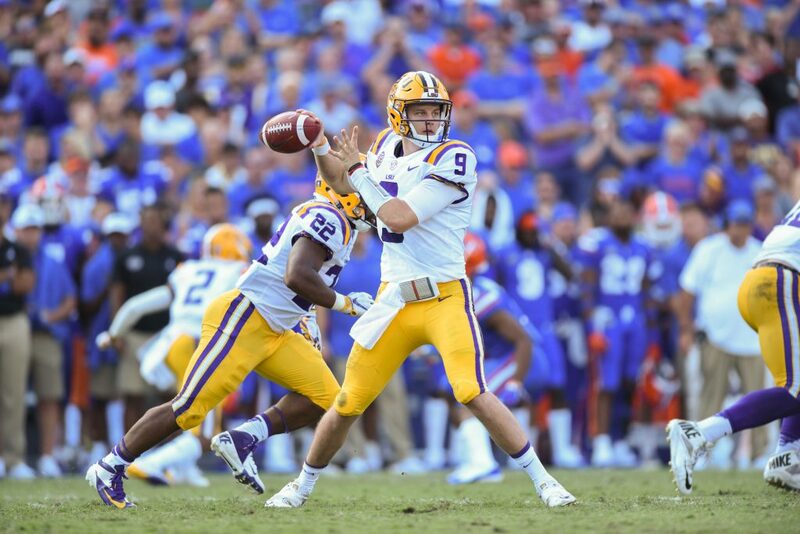 LSU quarterback Joe Burrow (9) drops back to pass in the first half. 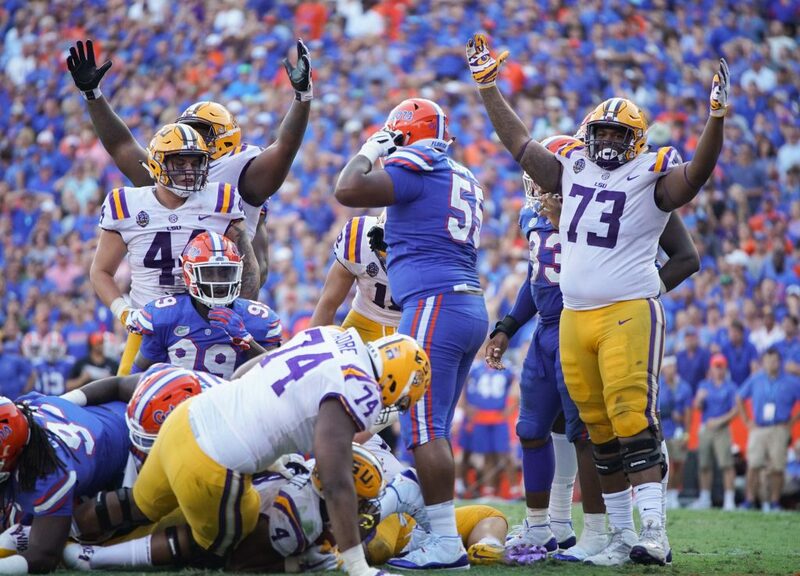 Burrow had a tough outing against the Gators, completing 19 of his 34 attempts for only 191 yard, zero touchdowns and two interceptions. 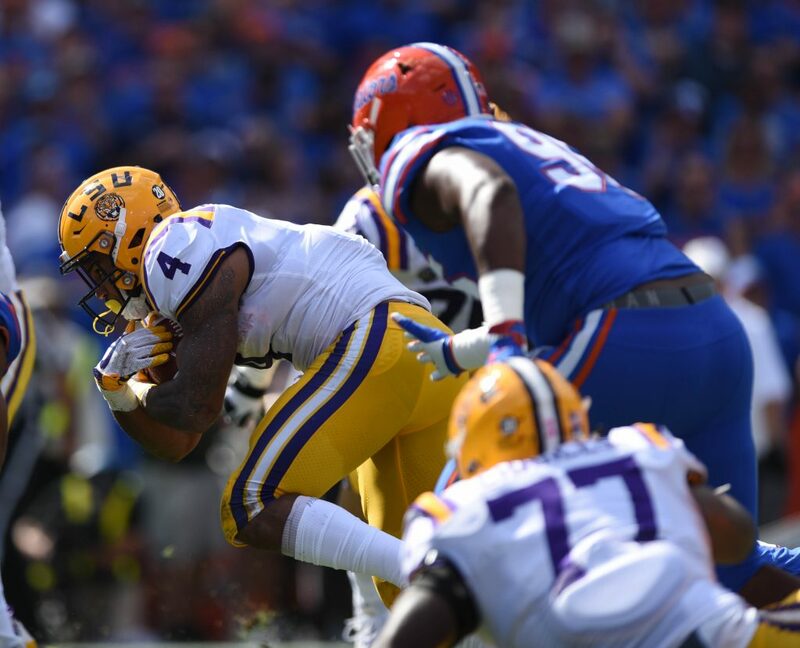 LSU running back Nick Brossette (4) barrels his way through the Florida defense. Brossette lead all rushers with 95 yards on 15 carries, also scoring two touchdowns. 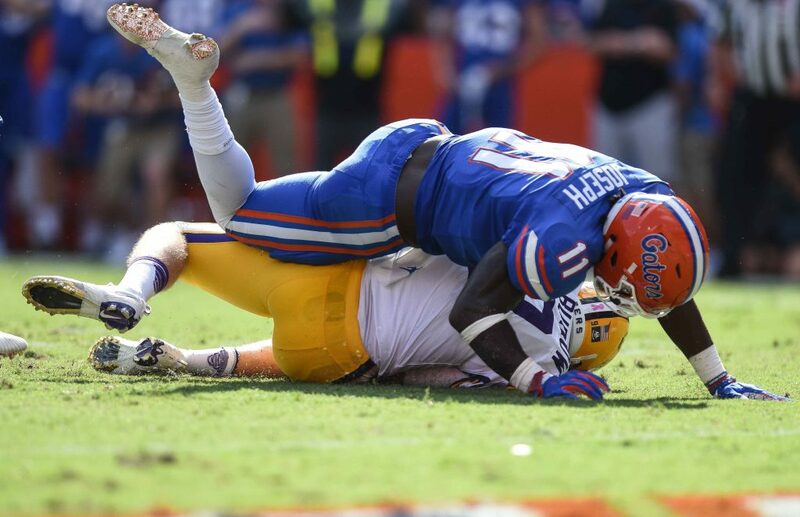 Florida linebacker Vosean Joseph (11) sacks LSU quarterback Joe Burrow (9). 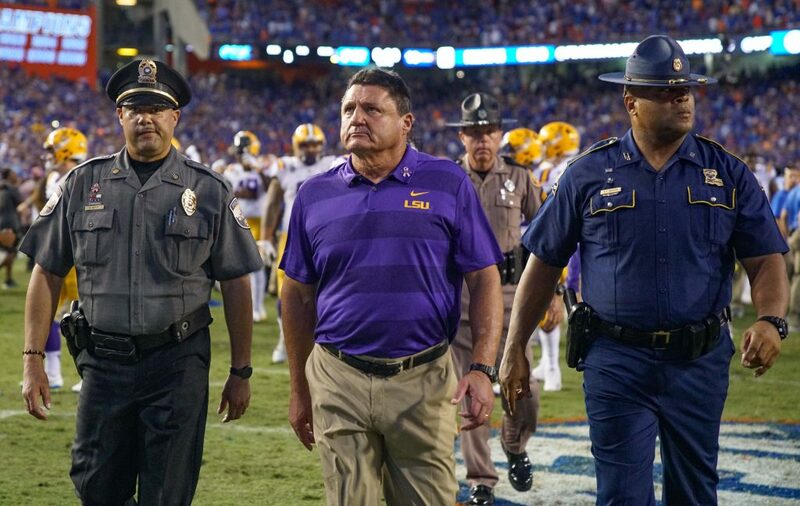 After being upset by the Gators, LSU head coach Ed Orgeron leaves the field defeated. 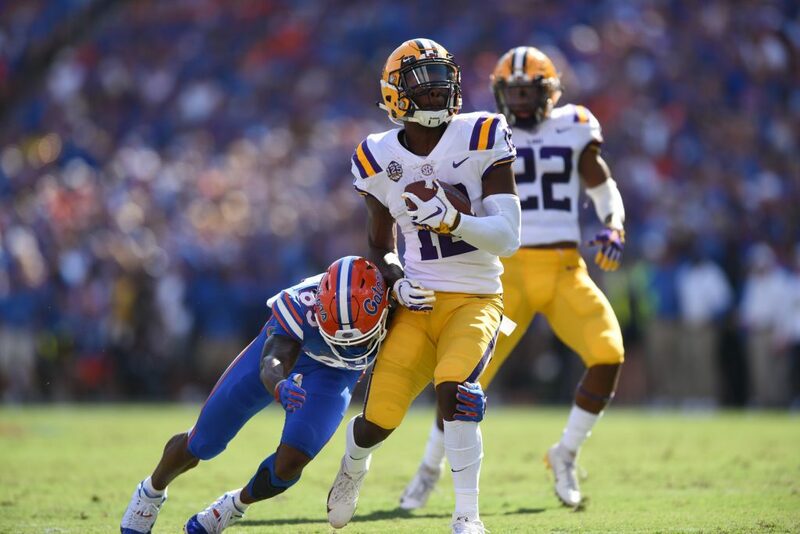 Florida wide receiver Josh Hammond (10) pulls in a catch despite heavy coverage from LSU cornerback Kary Vincent Jr. (5). 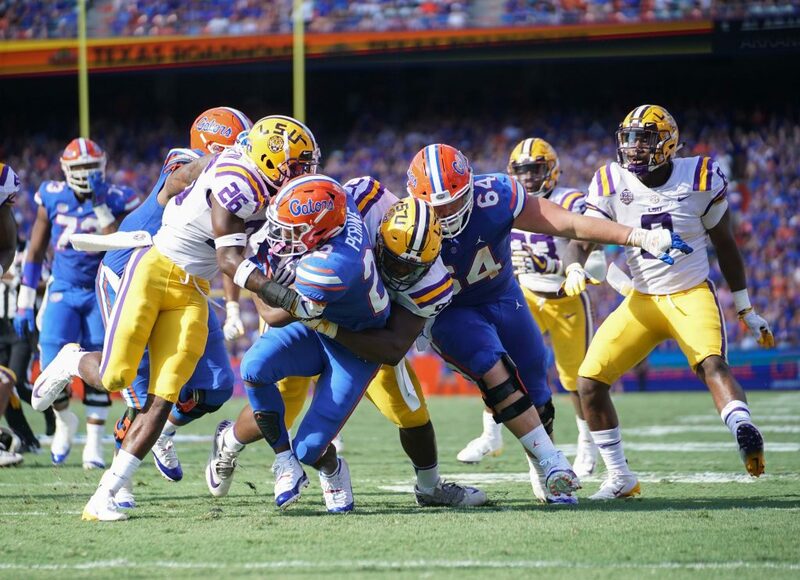 Florida running back Jordan Scarlett (25) barrels his way through the LSU defense. 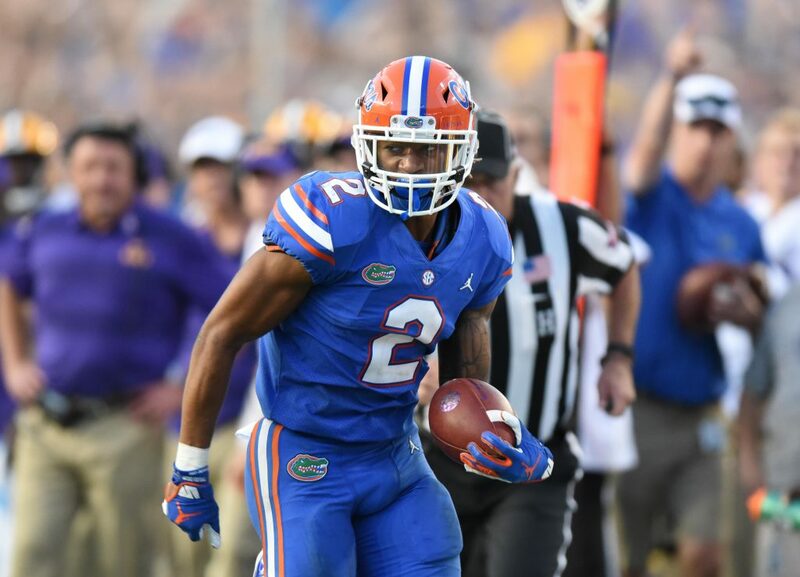 Scarlett was crucial to the Gators run game, finishing with 65-yards on 16 carries. Scarlett also picked up key 1st downs in the second half to keep drives alive. LSU wide receiver Justin Jefferson (2) pulls in a catch in the first half before stepping out of bounds after securing the ball. 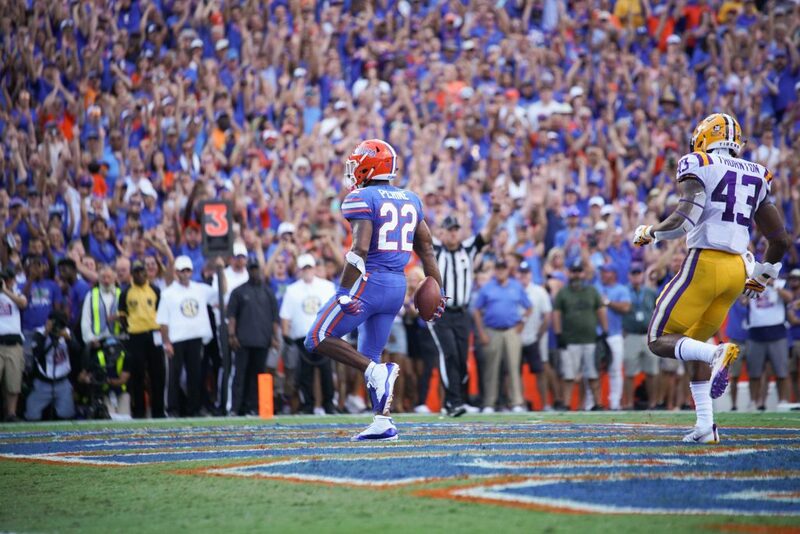 Gator running back Lamical Perine (22) scored Florida’s first touchdown of the game in the first half on a 1-yard run. Perine lead the Gators in rushing and touchdowns, carrying the ball 17 times for 85-yards and two touchdowns. 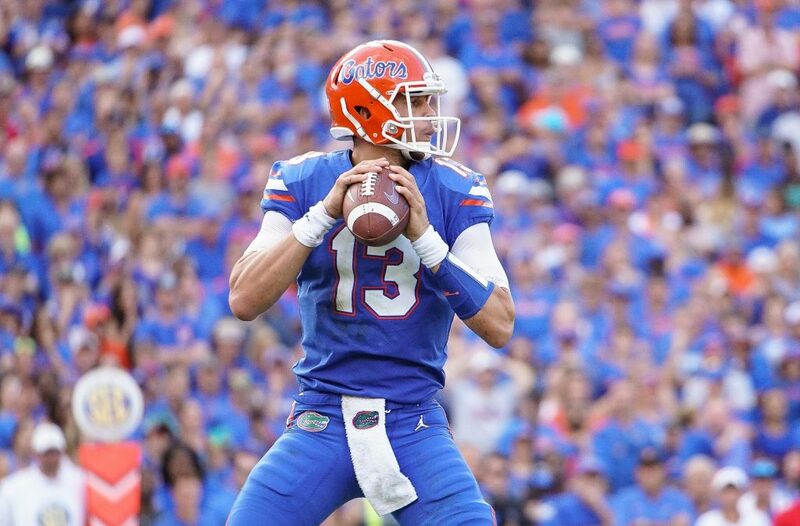 Florida quarterback Felipe Franks (13) drops back to pass. Franks completed 17 of 27 passes for 161 yards, and threw one touchdown and one interception. 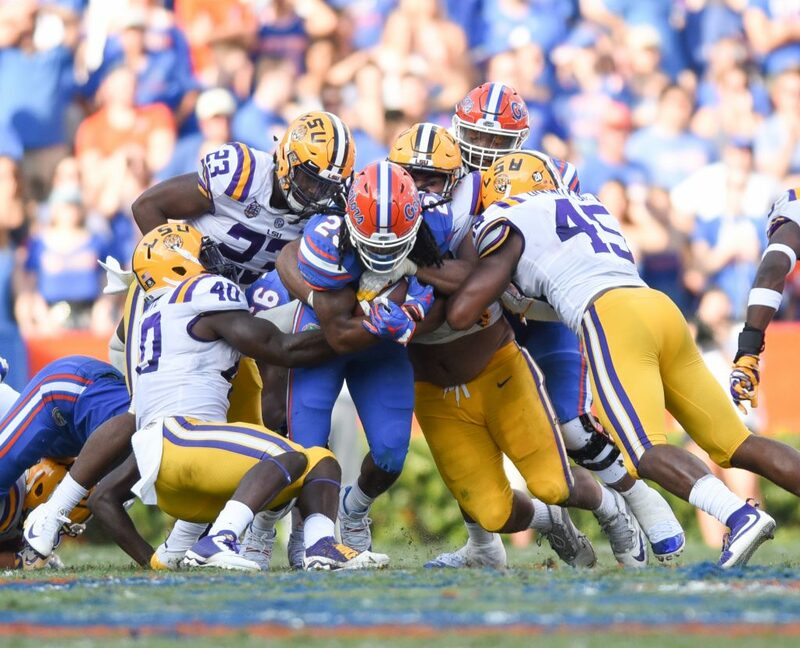 Florida running back Lamical Perine (22) is forced down by two LSU defenders. 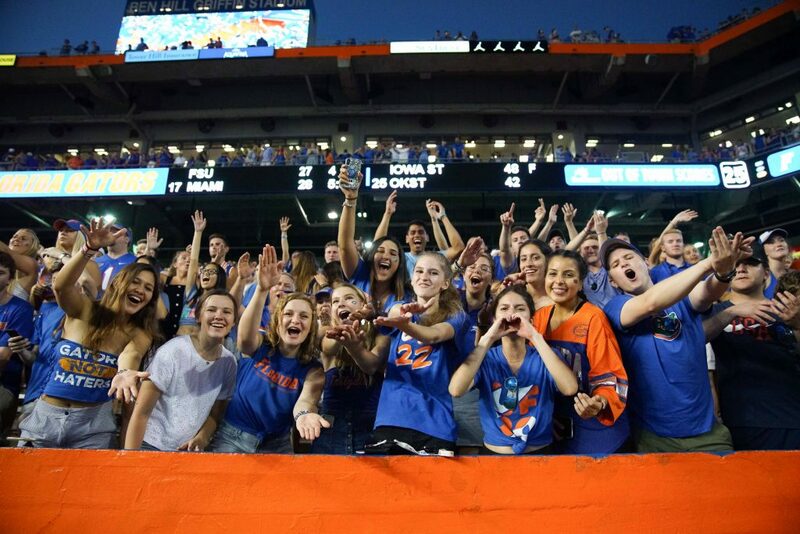 Florida fans celebrate the upset following after the game is over. 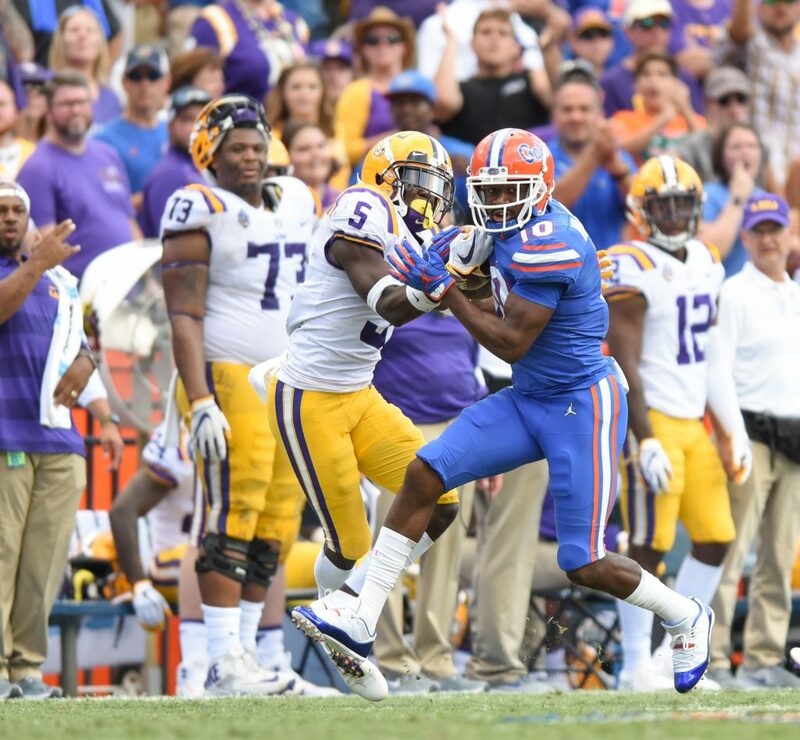 Florida wide receiver Tyrie Cleveland (89) takes down LSU wide receiver Jonathan Giles (12) during a kickoff return. 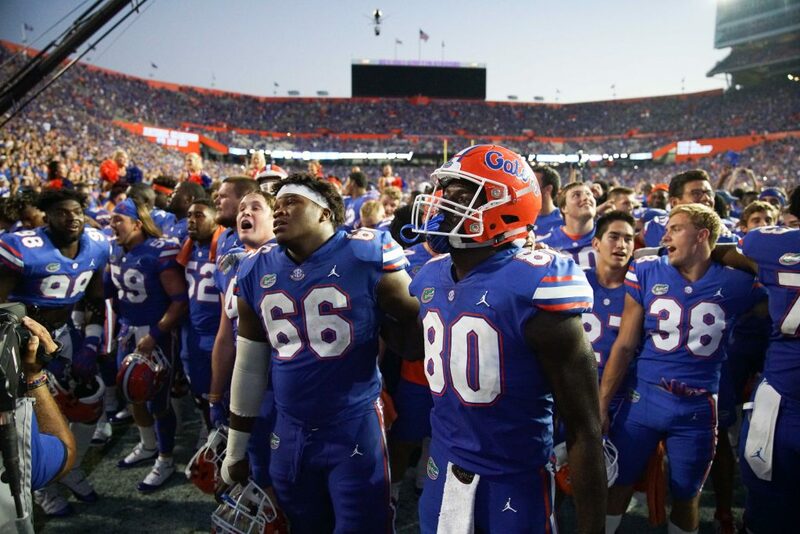 After securing the victor, Gator players make their way toward the band to sing the alma mater and celebrate with fans. 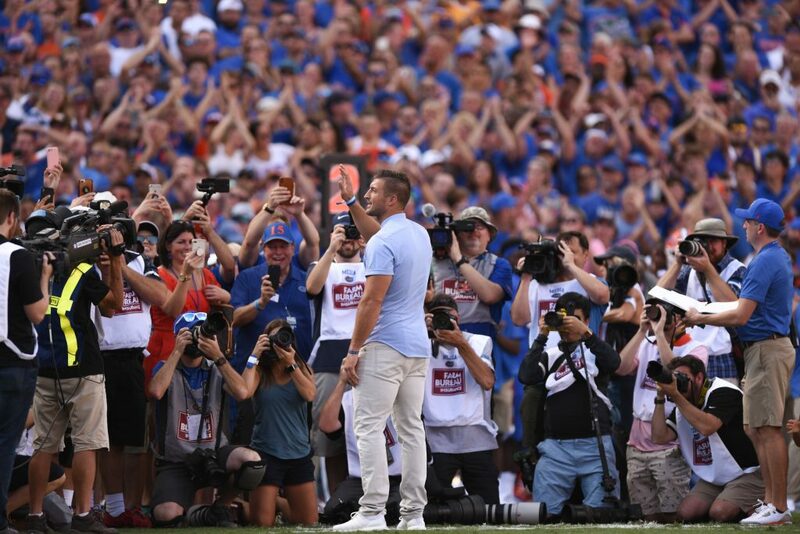 During halftime, former Florida quarterback Tim Tebow was inducted into Florida’s Ring of Honor. 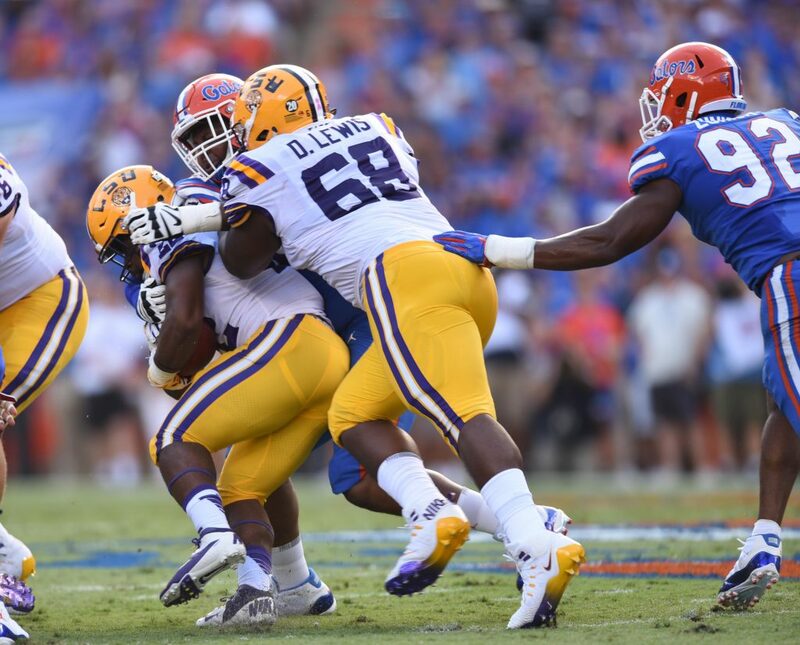 Florida defenders work to bring down LSU running back Clyde Edwards-Helaire (22). 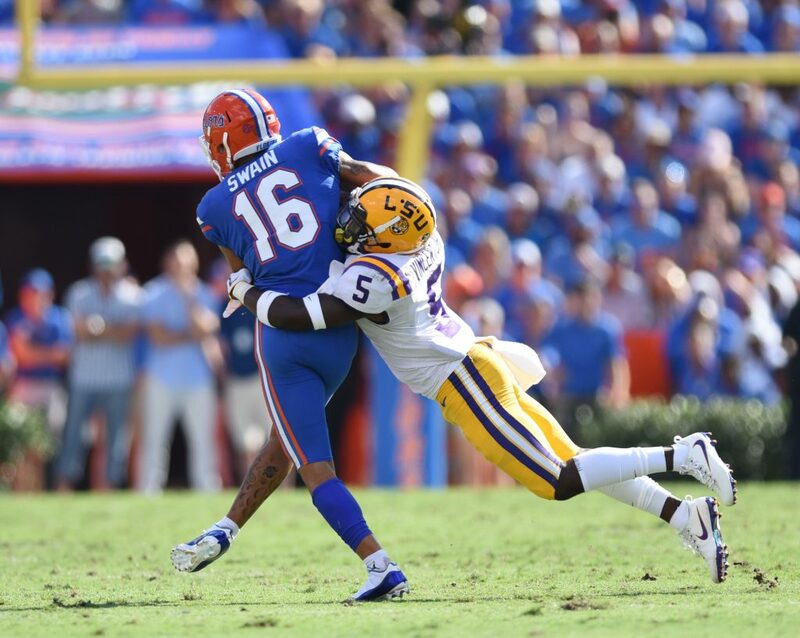 After securing a catch, Florida receiver Freddie Swain (16) is brought down by LSU cornerback Kary Vincent Jr. (5). 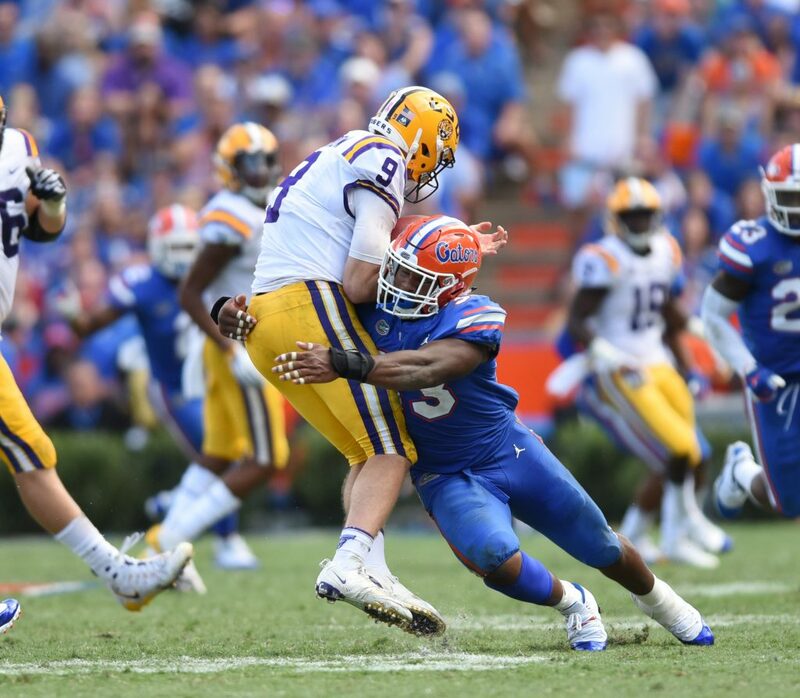 LSU quarterback Joe Burrow (9) is brought down behind the line of scrimmage while scrambling by Florida linebacker David Reese (33). 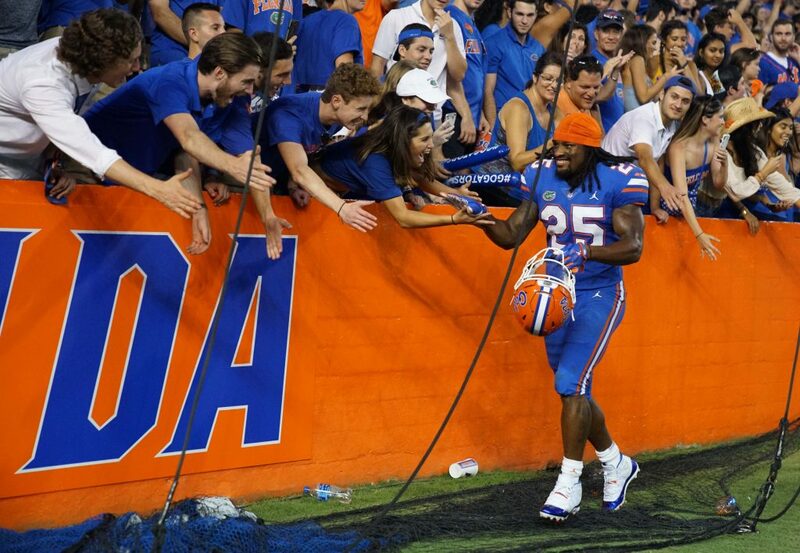 Fans lean over the wall to high-five Florida running back Jordan Scarlett (25) after the game. 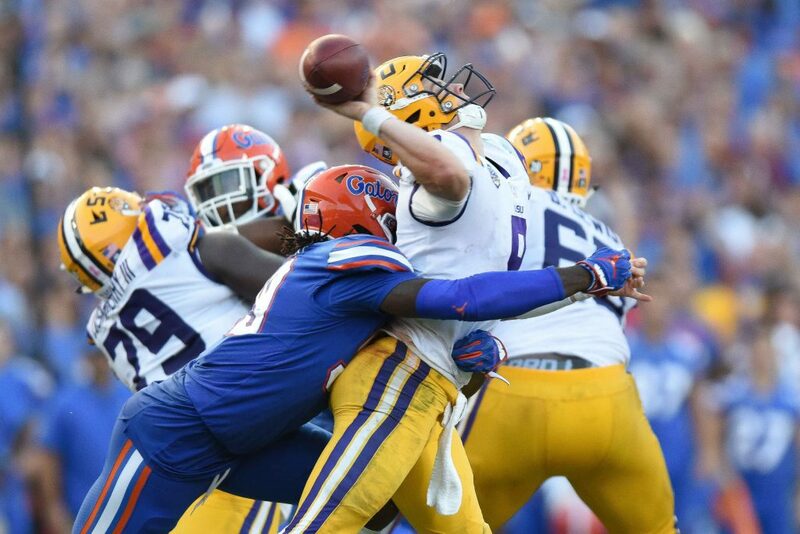 LSU quarterback Joe Burrow (9) is rocked with a hard hit from Florida defensive lineman Jachai Polite (99). 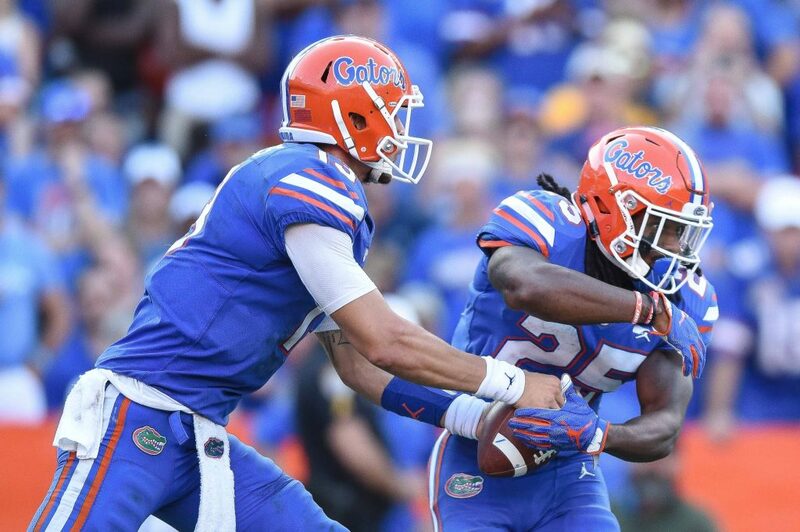 Florida quarterback Felipe Franks (13) hands off the ball to running back Jordan Scarlett (25). 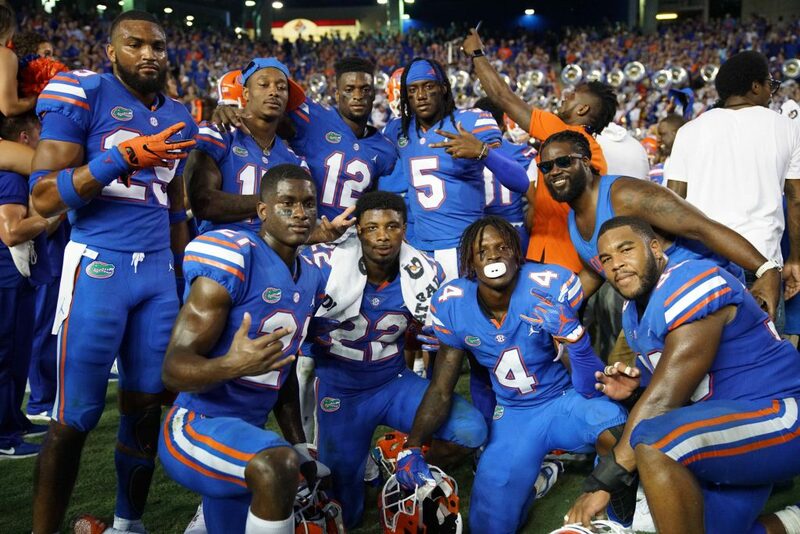 Florida players celebrate on the field by posing for a photo after completing an upset on the No. 5 team in the country. 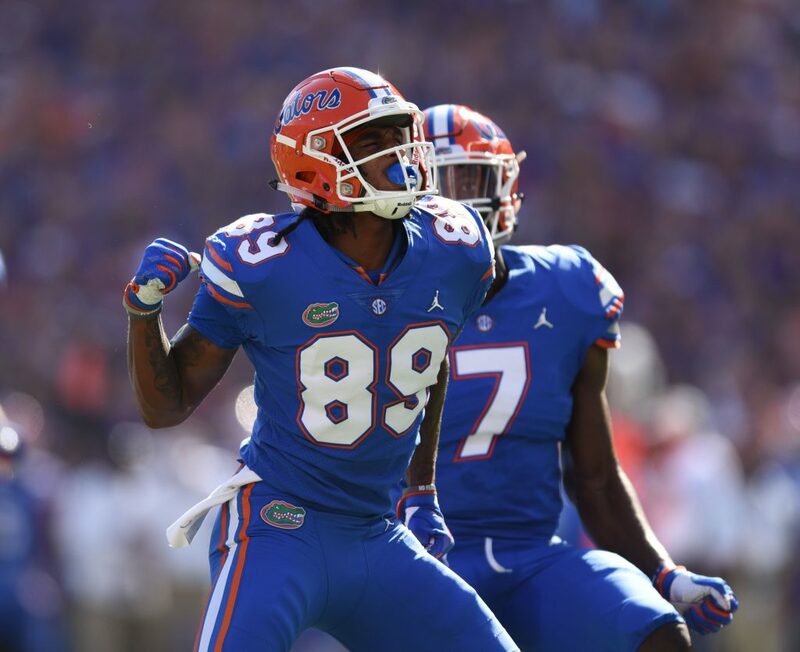 Florida wide receiver Tyrie Cleveland (89) shows emotion after making a play on special teams. 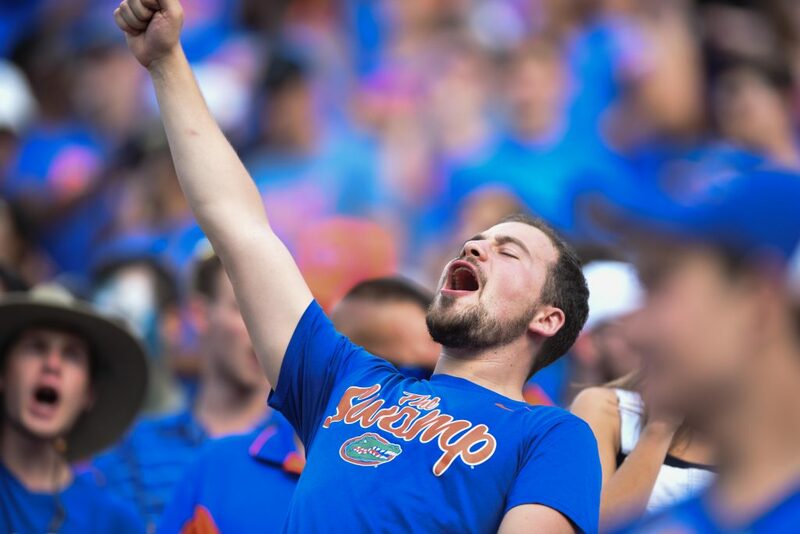 A Florida fan celebrates after a Lamical Perine (22) touchdown. 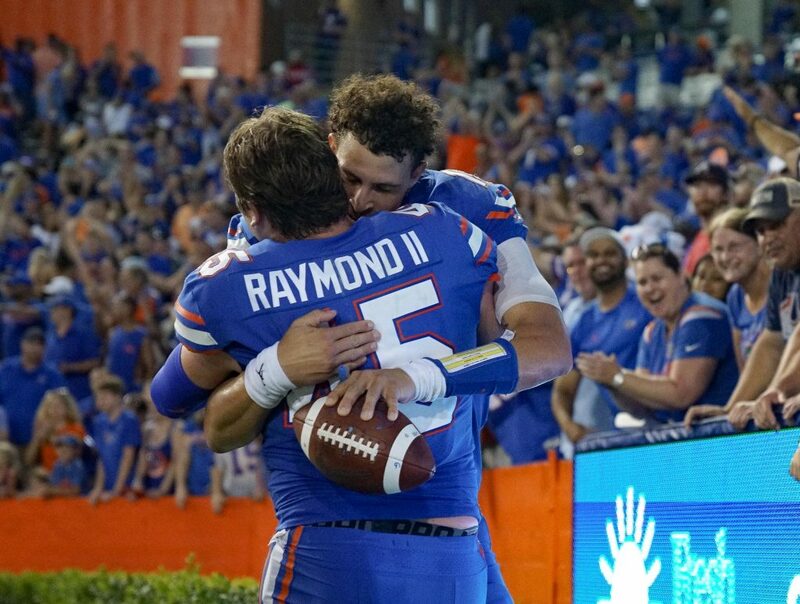 Florida players Felipe Franks (13) and R.J. Raymond (45) embrace one another after the game. 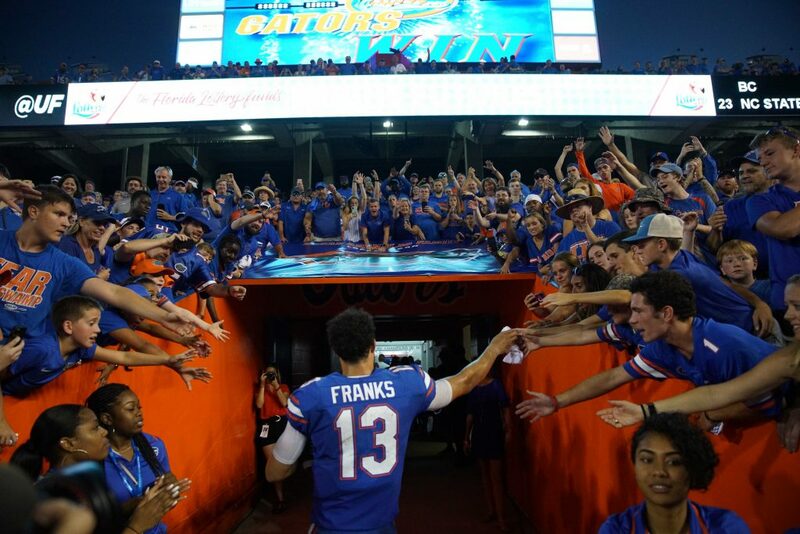 Florida quarterback Felipe Franks (13) makes his way into the locker room after the game as fans cheer him on for his game play. 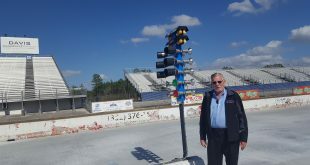 Greenberry Taylor is a reporter who can be contacted by calling 352-392-6397 or emailing news@wuft.org.